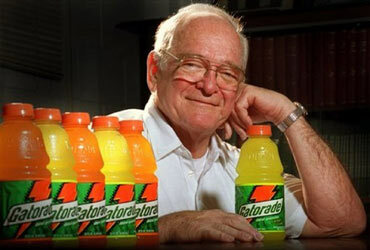 The Cade Museum for Innovation and Invention is named for Dr. James Robert Cade, a professor of renal (kidney) medicine at the University of Florida and the lead inventor of the sports drink Gatorade. On the title page of his autobiography, Freut Euch Des Lebens (Take Joy in Life) Cade described himself as a “physician, scientist, musician, and inventor.” Though he is most widely remembered for Gatorade, he was a man of many parts; a true Renaissance man. At the time of his death in 2007, Cade had a collection of over 30 violins, (some of them dating to the 17th century) and over 60 Studebaker carriages and automobiles from the late 1800’s to 1965. Many people certainly were changed by Cade’s numerous inventions and ideas, including the first shock-dissipating football helmet, a high-protein milkshake used by surgical patients, athletes, and cancer patients, and a new method for treating autism and schizophrenia through diet modification. 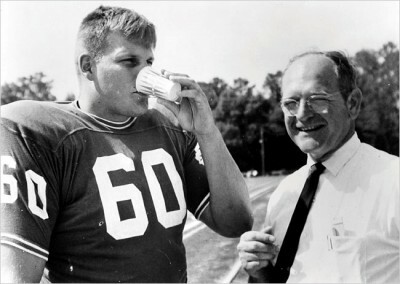 Gatorade, Cade’s best known invention, was the result of an offhand query posed by a University of Florida football coach in 1965. Cade and his team of researchers began investigating dehydration on the sports field – at the time a topic on which no reliable data existed. Their experimental drink was credited for several unexpected victories by the Florida football team in 1965 and 1966, which quickly led to commercial success. Today Gatorade has worldwide sales of almost $2 billion. Dr. Cade was also a man of great faith. A lifelong Lutheran, he was the 1991 recipient of the Wittenberg Award and gave generously to many Lutheran colleges and organizations. His Christian beliefs inspired and informed everything he did, including his scientific research, hobbies, and friendships with people from all walks of life. In the last years of his life he and his wife Mary established and endowed the Gloria Dei Foundation, a small grant-giving organization focused primarily on the needs of the poor and underserved. James Robert Cade was born on September 26, 1927 in San Antonio, Texas. After service in the Navy at the end of World War II, he attended school at the University of Texas from 1948-1950. In 1953 he married Mary (Strasburger) Cade, a nurse from Dallas. In 1961, after completing a post-doctoral fellowship at Cornell University Hospital in New York City, Dr. Cade took a position at the University of Florida medical school, where he remained the rest of his life. Together he and Mary raised six children and helped raise twenty grandchildren. 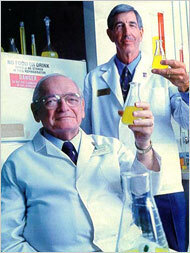 Dr. Cade died in Gainesville on November 27, 2007.